This November brings a new crossover miniseries from BOOM! Studios. 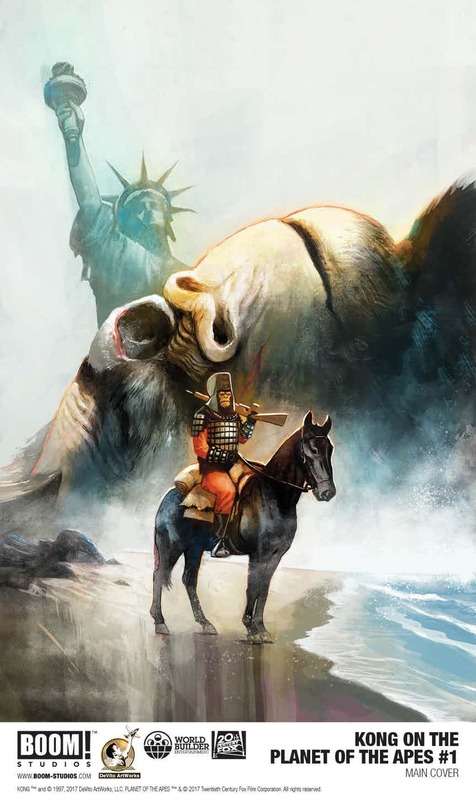 Kong on the Planet of the Apes comes from writer Ryan Ferrier with art by Carlos Magno, who has drawn both Planet of the Apes and Kong of Skull Island. The six-issue series picks up after the events of the first Planet of the Apes movie from 1968, with Dr. Zaius and General Ursus leading a group of soldiers to the Forbidden Zone where they are greeted by Kong. They travel to Skull Island to discover the truth, but will they survive the journey? Kong on the Planet of the Apes arrives in November.